Get a free trial to O’Reilly’s online learning platform and stay up to date on the technologies that will keep you competitive. When developers and tech leaders are figuring out what to do next, how to advance their careers, or offer more value to their companies, they need to know what’s hot and what’s not living up to the hype. Toward that end, we dove into the last two year’s worth of search data from our online learning platform to identify the topics you should consider exploring in the months ahead. We find search activity particularly effective for spotting shifts in technology usage: what’s gaining traction, what’s falling out of favor, and what topics are maturing. 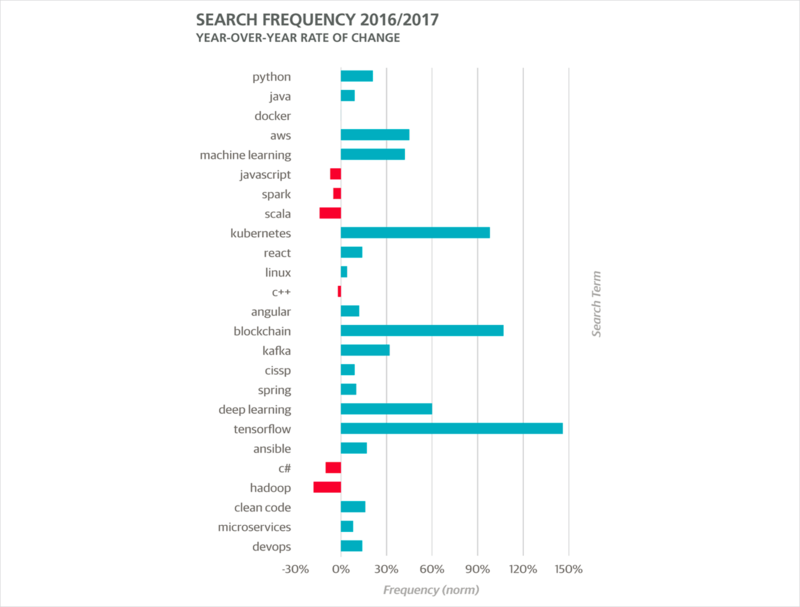 We compared search activity between 2016 and 2017, and identified the following trends, all of which should help developers and tech leaders invest their time wisely in the months ahead. Figure 1. The top 25 search terms on O’Reilly’s online learning platform in 2017. Python remains the No. 1 search term on our online learning platform, and its share of search activity is increasing. Python’s growth is likely fueled by the language’s adoption for data management, data engineering, and data analytics tasks, including machine learning (ML) and artificial intelligence (AI). Python is worth knowing and is a good choice for development, particularly when working with data pipelines. ML and AI have become topics of keen interest to learners on our platform. Terms like machine learning (the No. 5 search term and up 42% in year-over-year search activity), deep learning (No. 18, up 60%), and TensorFlow (No. 19, up 146%), all show considerable growth in activity. While still maturing, we see more learners moving past the exploration of ML and AI, and into the practical application of these tools. Java is the No. 2 search term with a moderate growth in search share. With its related frameworks and topics, such as Spring (No. 17 search term), Java is a tool that many learners on our platform use in a variety of contexts. Figure 2. 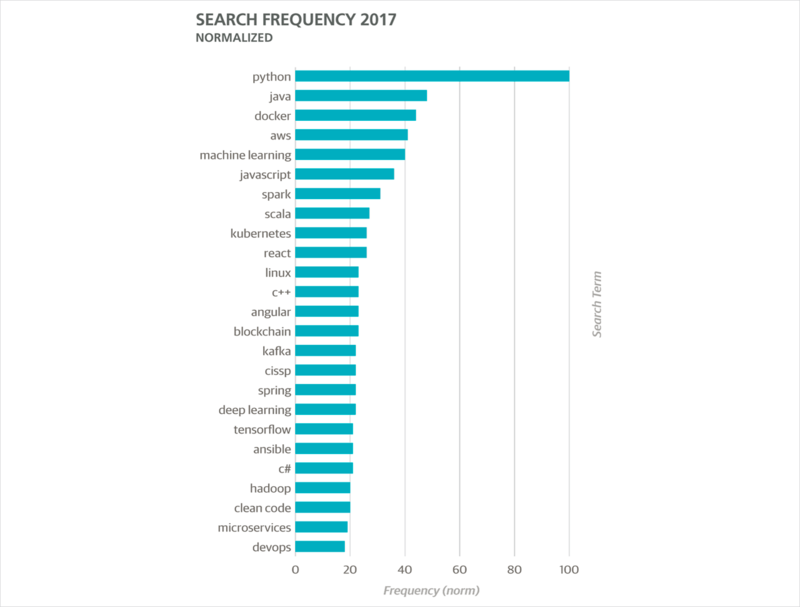 The top 25 search terms on O’Reilly’s online learning platform and their year-over-year rate of change in search frequency. The importance of cloud services and virtualization is made clear by AWS showing up as the No. 4 overall search term. Other top search activity reinforces the cloud’s position as a key area. Docker remains steady in popularity as search term No. 3, and Kubernetes has taken a leap to No. 9 (up 28 spots over 2016). Further down the list, we see the share of searches for Terraform (No. 71) up more than 200% and up 230 rank positions compared to 2016. Interest in these topics suggests developers realize their programs need to be developed, deployed, and managed. Bitcoin has climbed hand over fist, going up 128% in search activity between 2016 and 2017. However, it's still only No. 87 in our search results, and thus not shown in the tables in this article. The real winner in this area is blockchain (the No. 14 search term and 107% growth in search activity), which has many applications outside of currency or finance. Businesses, governments, and other institutions hope to reduce the cost and time of concluding contracts and performing other transactions. If these institutions feel that the blockchain is better than standard technologies at proving transactions took place, blockchain becomes even more appealing. Looking further down the list of search phrases, we note an uptick in the share of searches for two programming languages: Go and Kotlin. We know that Go, with its Pythonesque syntax, high performance, Google support, and strong pedigree is a good fit for the quick development turnaround and scale many web-based and data-oriented applications need. Kotlin is gaining traction for Android platform developers as a faster-to-market language for building mobile applications. Given the weekly revelations of breaches, the absence of search activity around security is concerning. We do see some learners search for the terms “security” and “hacking,” and others for one particular security tool (Wireshark), but these terms are nowhere near the top of the search rankings. Why is security not a top term? It’s possible security work is done in the service of an application, not the security itself, making searches for topics around programming languages, data, storage, and architecture more common than searches for security terms. Also, implementing security is often an asynchronous task for software developers. Once security is in, the developers focus on other levels of functionality. Whatever the cause for its absence from the top terms, security is an essential area that deserves ongoing attention. As for VR, AR, and IoT, products may need to coalesce around standards before these topics pick up speed. Furthermore, all these technologies have a hardware component. Once they find a foothold (as one observer thinks will happen to VR in industry), increased production may bring down costs and drive adoption. The search data from our online learning platform shows that practical tools and methods around AI and cloud deployment are growing in importance. Investing time in these areas should prove fruitful for developers and tech leaders. It also never hurts to refine your understanding of foundational topics. The continued dominance of Python and Java in our search activity suggests that further learning here is worthwhile. Ultimately, the specific things you need to learn depend on the field you're in or where you wish to go. But knowing which topics are on the move should help you decide where it's worth competing. This article is based on non-personally-identifiable information about the top 25 search terms on O’Reilly’s online learning platform in 2017. Article image: Antenna against a blue sky (source: dlohner via Pixabay).